The short answer is: Yes! It truly is important! Your dentist isn’t telling you to floss just because it sounds good, it really can save you from periodontal disease and eventually tooth loss. The first nationally representative analysis designed to determine how many people floss their teeth found that those who floss daily amount to 30% of the population. Just over 37% report occasional flossing, and slightly over 32% say they never floss. 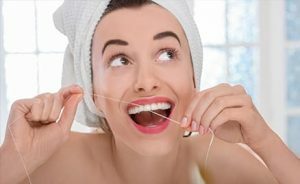 Flossing really is an essential part of taking care of your teeth and gums. Flossing alone can remove up to 40% of plaque. The American Dental Association recommends flossing at least once a day to help remove plaque from the areas between your teeth where your toothbrush can't reach. This is important because plaque that is not removed by brushing and flossing can eventually harden into calculus or tartar. Flossing also helps prevent gum disease and cavities. Perfect your technique. Use a piece of floss 15 to 18 inches long, slide it between the teeth, wrap it around each tooth in the shape of a "C," and polish with an up and down motion. Don't worry about a little blood. Bleeding means the gums are inflamed because plaque has built up and needs to be cleaned away. Don't let that deter you. However, if the bleeding persists after a couple of weeks, you should see your dentist. That could be a sign of periodontal disease. Get a floss holder. If you lack the hand dexterity to floss, try a two-pronged plastic floss holder which allows you to floss easily with one hand. We recommend the LISTERINE® ULTRACLEAN® ACCESS® Flosser, formerly REACH® ACCESS® Flosser. If you have questions about flossing your or your child’s teeth, please give us a call at 844-365-DENTAL to reach the nearest Dental365 location to you. Our team of professionals will get you in quickly to see one of our friendly dentists. Our dentists will be able to answer all of your questions and make sure you’re on the path to total-body wellness.